Abby the Librarian: Poop Happened! Poop Happened! : A History of the World from the Bottom Up by Sarah Albee, illustrated by Robert Leighton. Grades 4-8. Walker Publishing Company (Bloomsbury), May 2010. Copy provided by my local library. Poop. It's not really something we're supposed to talk about (in polite society, anyway). But waste disposal and sanitation had huge effects on the progress of world civilizations. Think about it - contagious diseases, especially waterborne diseases, kill a huge number of people every year. Cholera, polio, bubonic plague, typhoid... These diseases have shaped human history and their spread is linked to human waste disposal. Ms. Albee takes a look at human history through the lens of waste disposal and hygiene. She examines advances in sewer technology and how they affected different cultures and she explains how improper waste disposal is linked to the spread of disease. Kids are going to want to pick up this book. I mean, c'mon. The title alone will have them giggling and perusing. Add in the humorous illustrations and the flippant style and kids will be hooked. It might be a little much for kids to read straight through, but it's definitely something they'll dip in and out of. And while they think they're only being entertained by gross facts and cartoony illustrations, they'll be learning a load (haha) of really interesting things. Like the fact that improved sanitation actually lead to an increase in polio cases because people were no longer exposed to the disease as infants (thereby developing immunity). They started getting much more serious cases later in childhood. And paleoscatologists are scientists who study ancient poop. There's actually a lot you can learn from fossilized dung - like what people ate and what diseases they might have had. And the fact that early flush toilets had adverse effects on health, too, because they overwhelmed the fledgling sewer systems and polluted the major rivers - out of which everyone got their water for drinking and washing. The book's not without its faults... It's a little long (although I can appreciate wanting to cram in as much info as possible). And for a book that professes to be about "a history of the world", it spends the vast majority of its time on Europe (specifically England and France) with only a few passing glances at Asia and the Middle East (and Africa if you count Ancient Egypt). I can understand that it might be easier for an English-speaking author to get her hands on European sources, but I wish the scope of countries covered had been broader. However, kids are probably not going to care about that. 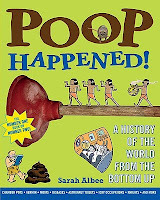 They're going to scoop up a book that has "poop" in the title and they will be suitably entertained and enlightened. Check out more reviews at A Chair, A Fireplace & A Tea Cozy, Charlotte's Library, and Welcome to My Tweendom. And hey, happy Nonfiction Monday! Check out this week's roundup at Simply Science. Poop Happened! is on shelves now.